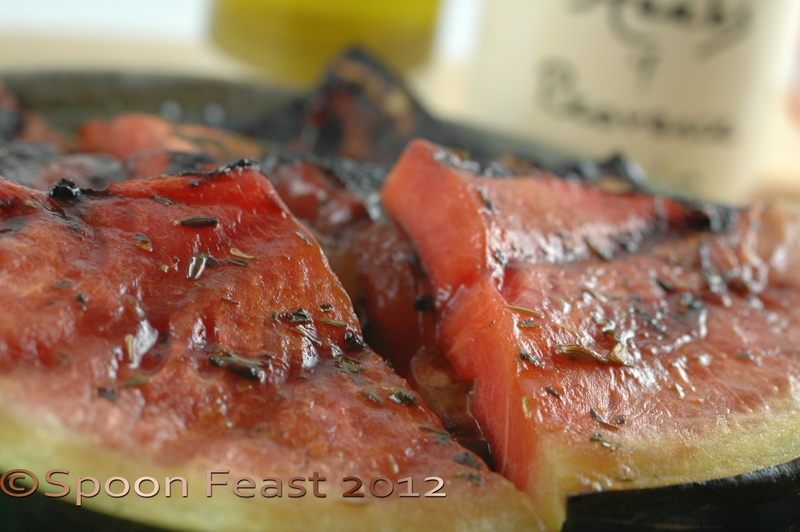 Uh huh, you heard that, Grilled watermelon. Get your grill hot, really hot. Slice watermelon about finger width or thicker slices. 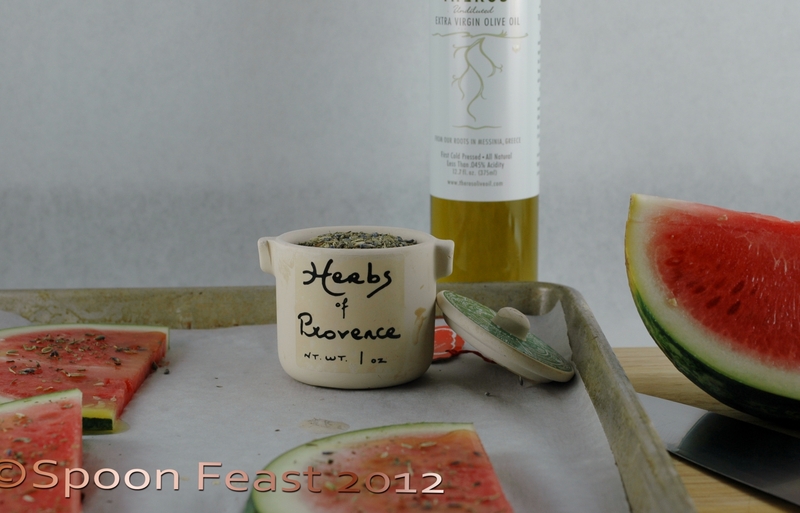 Drizzle the melon with a high quality Greek olive oil such as Theros unfiltered extra virgin. Sprinkle Herbs de Provence. Fleur de Sel (or kosher or sea salt) and grind some fresh black pepper over the oiled slices. 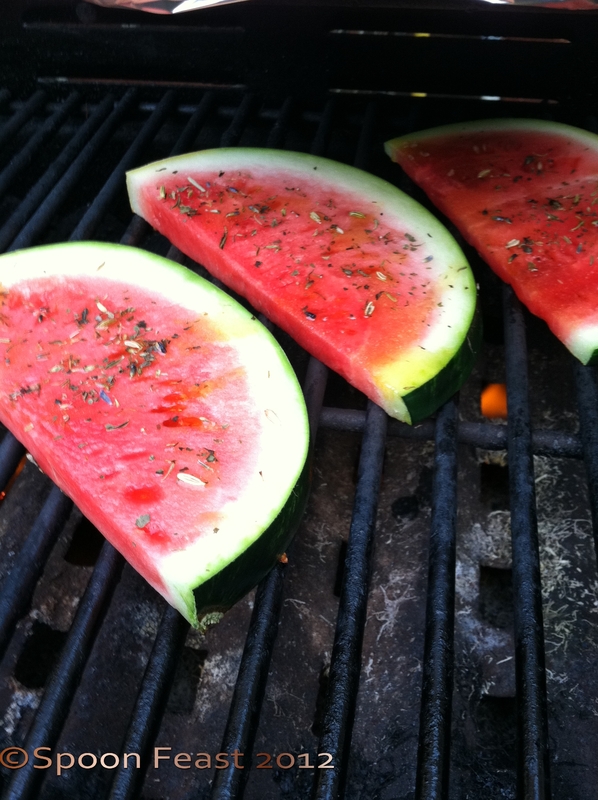 Place the watermelon on the hot grill for 3-4 minutes. Once grill marks appear, flip and grill the other side. 5 minutes is all it takes once you have a really hot grill. You want the melon to have some chars on it. The flavor and texture totally changes and is a refreshing, wonderful treat! Your friends and neighbors will think you crazy at first, but they will soon be grilling their own watermelon and smacking their lips too. 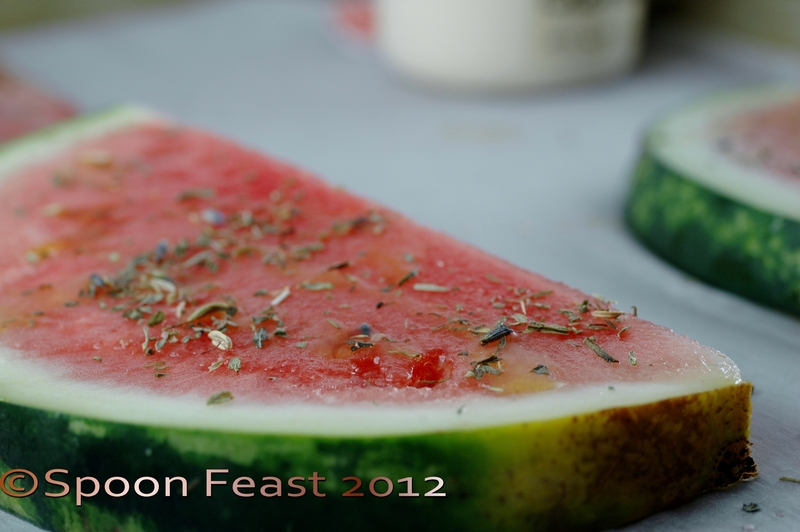 Do you think Grilled Watermelon will be as popular as deep-fried turkey? Stay tuned! Find out how YOU can win a bottle of Theros Unfiltered Greek Olive Oil. This entry was posted in basic skills, Cooking, Recipes, Southern Cooking and tagged Barbecue grill, Black pepper, cook, greek olive oil, grilling, grilling vegetables, Melon, Memorial Day, Olive oil, vegetables on the grill, Watermelon. Bookmark the permalink. ← All About Potatoes – What is the difference? The flavor changes too. It is very unique and refreshing! This is such a unique idea, i def need to try! Please do, then let me know what you think! really cool. where did you get the idea? is it something traditional somewhere in this globe or you just came out with it? lovely photography in this post, I love the close- up of the first pic and the nice composition of the second. brava! Thank-you! Not an original idea, I have heard of it before but not with olive oil and herbs de Provence. I actually have to try this! I would have never thought of it on my own! I hope you do try is as it is quite refreshing and different. Thanks for stopping by!